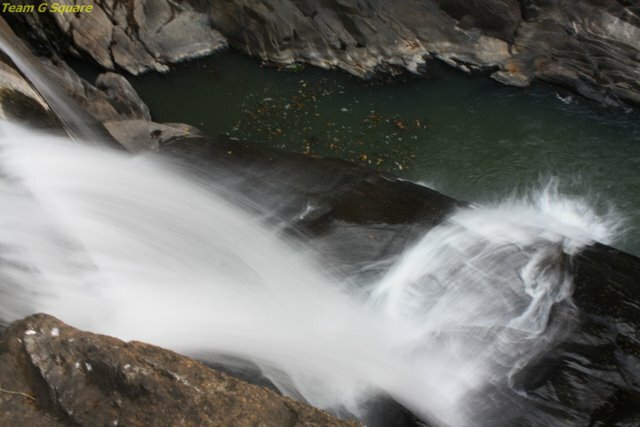 As we were enjoying our evening coffee at our new found home stay, our guide proposed an exciting plan of exploring another waterfall, this time it sounded more interesting as it was his first time too to that waterfall! For us, the name of the falls was very new as we had never heard of it before. And so we hit the dirt road and started following our guide's directions, which he was unsure about. As expected, we reached a dead end and decided to back track. Just as we reversed, we met a person who on inquiring about the route to the waterfall, volunteered to send his son along, to guide us. The little guy came along confidently to guide us to the location of the waterfalls. After walking a few miles in the Areca farm, we reached a stream that was formed by the water fall. A little further, we spotted the falls and reached its downstream. Our chances of entering the water pool was low, as none were sure of the depth of the water and since the water force was quite high, we did not risk going further. We trekked to the top o the falls and enjoyed the view from above. Standing on the rock edge of the waterfalls and surrounded by greenery, the sight was simply was mesmerizing. Our ears were filled with the sounds made by the chirping birds and falling waters. 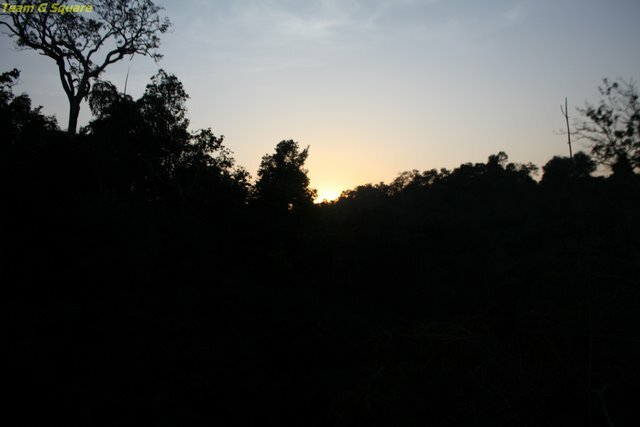 It was late evening and the time had come for the sun to set, giving us an indication that it was our time to head back and reach our home stay safely. Gorgeous! This is pure heavenly! I am glad you decided to explore it. All the pictures are breathtakingly beautiful. Wonderful virtual tour to a place untouched... Many thanks for taking us there and thanks also to the handsome little man! Please keep posting. Very gorgeous falls over the many rocks! The young guide boy is so lovely.Your photos make me feel cool.I enjoyed walking in the cool woods with beautiful falls! What a wonderful post and photos for the day!! Good to see them both, I have missed the great trips that you take us on through your captures! I do love waterfalls and these are breathtaking! And what a handsome young guide you had! Thanks for sharing the beauty! Have a great week! Finding a little-known waterfall is always an exciting adventure. You found a real beauty. You also found a very handsome young guide. Thanks for sharing your discovery with us. Beautiful falls. Where exactly is this? Wonderful shots from real nice place. Fantastic shots of a wonderful place! Great portrait too. wow!! wonderful place to chill! Loved all the pics and the the young guide is really handsome..
Sure would have been a wonderful time!! Nice . Reminds me of Chunchankatte Falls. Serene & tranquil place for some moments of peace & quiet ! 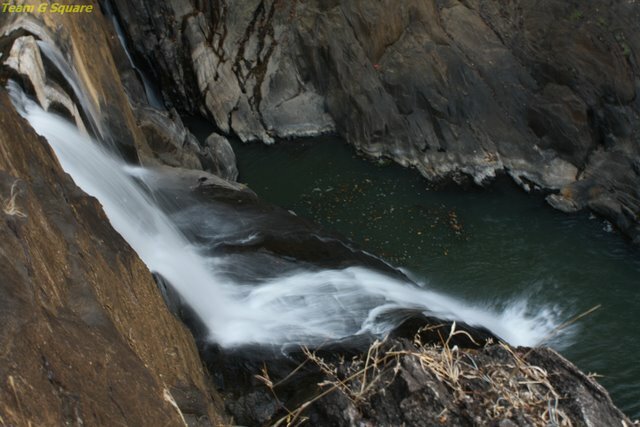 really wonderful falls..and best part 9is the serenity all around!! Beautiful shots? What camera do you use? 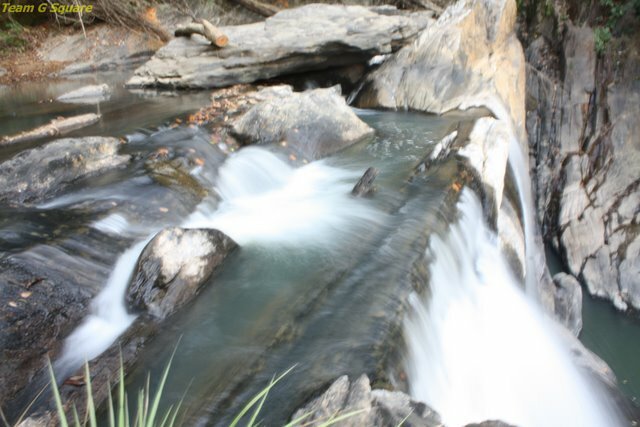 Pics clicked with slow shutter speed, right!! !